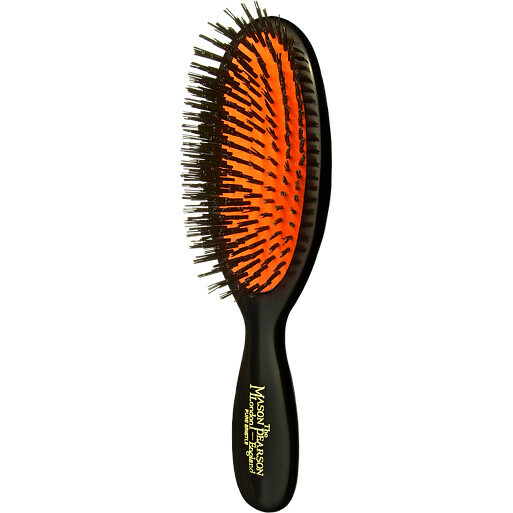 This boar bristle brush is best for fine hair, with 5 rings of extra stiff pure bristle tufts to stimulate blood flow to the hair roots. The density of the bristles allows conditioning sebum to be more evenly distributed from the roots to the ends of the hair. Mason Pearson Brushes Pure Bristle Pocket is rated 4.8 out of 5 by 8. Rated 5 out of 5 by Gift from No compalints I had difficulty finding the exact item I needed on-line this comany was one of the few that could provide it. Their service was prompt and efficient. Rated 4 out of 5 by Ozzz from High quality brush I have long fine hair and purchased Mason Pearson pure bristle pocket brush as per a sales assistant's recommendation. I went for the lovely salmon pink tone. The look and feel of this brush is amazing. It is very good for putting hair in shape, but sometimes when the hair is a bit oily it sculpts the hair too much. I normally take a shower in the morning and brush my hair with Mason Pearson brush the night before so that my hair can benefit from the distributed oils produced by the scalp naturally throughout the night. It might be worth going for the handy size for very long hair as pocket size might be a little small. I was a bit unsure about whether to go for the pure bristle or the pure bristle sensitive as my skin and hair is very sensitive, but I think I made the right decision by picking pure bristle. Sensitive pure bristle is more for people suffering from sensitive scalp. The only downside is that these brushes cannot be used on damp/wet hair, so I use the Wet Brush for that. It is a shame that one wouldn't be able to try these brushes in store before purchasing. It is such a big investment that I wish I could have tried a few different sizes and bristle types. Rated 5 out of 5 by Sarah1978 from Brilliant brush I have stopped straightening my hair and I no longer use any products since buying this brush. This size is perfect for my fine hair.